After failing in its efforts to have YouTube shut down the Alex Jones Channel, CNN is now lobbying Facebook to shut down Infowars. In an�article�for CNN, senior media reporter Oliver Darcy explains how he tried to convince Facebook top brass to terminate our Facebook presence. "Facebook invited me to an event today where the company aimed to tout its commitment to fighting fake news and misinformation. I asked them why InfoWars is still allowed on the platform. I didn't get a good answer," tweeted Darcy. 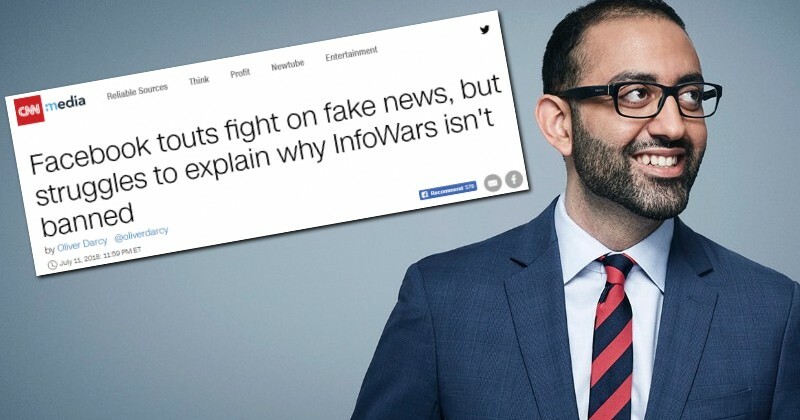 In his CNN piece, Darcy reveals how he asked the head of Facebook's News Feed John Hegeman, "How the company could claim it was serious about tackling the problem of misinformation online while simultaneously allowing InfoWars to maintain a page with nearly one million followers on its website."